Put the apartment back to some semblance of order. We’re still hanging the rug out to air, so furniture and containers are all over the place. I’d like to see all of them back in place, on top of a washed floor, by Sunday night, because until that happens, we have nowhere to dry laundry. To accomplish this task, I’ll need to buy a new Swiffer, since our first generation one finally disintegrated. I should probably also track down some new vacuum bags, since our last one has been loaded down with baking soda. De-stone whatever fruit remains in the refrigerator and freeze it. Refill the tea canisters, so I can have more choices again. Finish my library book and return it and several others, all overdue, to the system. 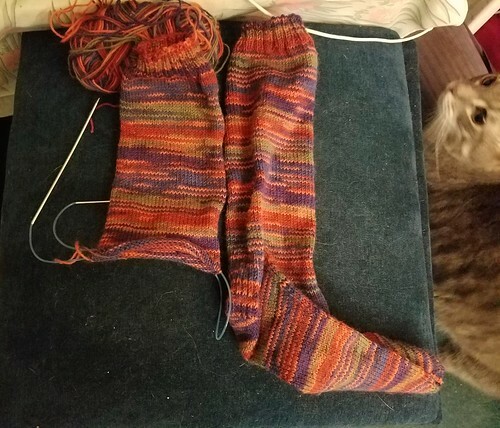 Turn the heel on the sock you see above. It’s a Christmas present for Rudi. From last Christmas. Go to the garden. See if my tomatoes survived the deluge. Pinch back the basil. Maybe plant some beans. Buy corn, peaches, and tomatoes (also, maybe grapes) at the farmers market, because what meal is complete without at least one of those these days? Find out if the sunflower fields in Maryland are still in bloom. We were supposed to head out there on Tuesday, but then we returned to a flooded apartment, so now we’re aiming for Sunday. Attend the Miles Morales (Spiderman) book launch party at the comic book shop in my neighborhood. I’m really excited to read it, and not just because author Jason Reynolds is living in D.C. right now. Lovely socks! I returned to work on Friday and students report on Thursday so this weekend is spent doing lesson plans and supply shopping. I did manage to get up a blog post yesterday and am working on one for today but we will see how far I get. I can’t believe summer is nearly over but here in Florida we have at least three more months of very warm weather. love your list, because the weather has chilled I’ve been thinking of holiday knitting and what I would make if I was so inclined. I have many ideas all yet to be noted on paper.